Carey's work is direct yet complex, full of hidden depths. Figures lie at its heart, but never alone. Recurring motifs include masks, heads, fish, birds, paper hats, icons, tattoos, keys, moons, hearts, wings and even the belching towers of Grangemouth, not too far from her Stirling home. No-one else could mimic the freshness June Carey brings to her creations, which manifest themselves in a dizzying mix of media, from pastel to paint, etching to digital print and 3D. Sometimes all the media fuse brilliantly in one glorious creation. And, as with all of Carey's work, these initial ideas make their way towards a very different outcome from the one she envisaged. Surveying her output over the decades, it's clear a voyage around herself has been taking place. Jan Patience, Journalist & Art Lover, Glasgow Herald and Daily Record. Dreams play an important role in Carey's work. Her superb book 'The Art of June Carey - Seeing Through Dreams' makes this very apparent. Carey's work is essentially about love - "the love that moves the sun, and other stars", - as Dante described it. Like Dante's 'Divine Comedy', her work features Heaven, Hell and Purgatory. By far, Heaven is her favourite place, as the vibrant blue backgrounds which frame her serene, angelic figures, testify. 'The Art of June Carey, Seeing Through the Dreams' is available in Paperback £19.99, Hardback £29.99, and a Limited Edition Hardback £150 (including an original etching, 'Waiting for Love'). 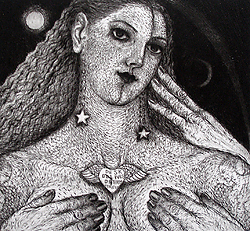 Above: 'Waiting for Love', etching, 15 x 16 cm.